The mission of the Women’s Cancer Research Center (WCRC) Breast Cancer Research Advocacy Network (BCRAN) is to build a partnership between breast cancer survivors, co-survivors and scientists to accelerate the progress of cancer research. To enhance the relevance, to breast cancer patients, survivors and co-survivors, of research questions. To connect scientists to survivors/co-survivors who can speak for the concerns of the breast cancer population, beyond their personal experiences, so that research goals and study feasibility can be developed together. To increase awareness about participation in research among new patients and those currently in treatment to improve clinical trial recruitment and enrollment. To include patients and survivors in developing critical science questions in order to increase funding for high-quality research. The BCRAN is led by Carola Neumann, MD, and Karen DiVito, BS. Why do we need breast cancer research advocacy? Advocacy is crucial in order to advance breast cancer research to find better treatments for breast cancer patients. Breast cancer survivors, their families and caregivers are in the unique position to support cancer research through active participation in research design, review and patient recruitment. Since researchers many times don’t have direct contact with patients, it is therefore very important for advocates to have the opportunity to interact and provide the patient perspective. A patient’s perspective will make scientific advances more timely and effective for cancer patients. It is recommended that survivors be out of active treatment for at least one year before engaging in research advocacy initiatives. Interested advocates are invited to participate in monthly meetings with various topics including: purpose and design of breast cancer research studies at UPMC Hillman Cancer Center, including novel research on breast cancer treatment, detection and prevention; planning of breast cancer research advocacy-related events; and other topics related to breast cancer research advocacy. The purpose of these meetings is to build a strong breast cancer research advocacy group here at Hillman. In a one-day session, advocates will receive relevant training regarding public policies, health awareness, out reach programs, breast cancer research, clinical trials, grant review, and how to apply for advocate funding. Advocates will receive a certificate upon completion of the training session. Making the connection: What are opportunities for breast cancer research advocates? We invite advocates to participate in educational sessions explaining the purpose and design of ongoing breast cancer research studies and clinical trials at UPMC Hillman Cancer Center in order to raise awareness in the community about these important research activities and clinical trial opportunities. Research programs within the WCRC focus on a number of critical topics. For example, researchers are examing the effects of hormones such as estrogen on breast cancer development and treatment; the different subtypes of breast cancer, including invasive lobular carcinoma (ILC) and ductal carcinoma in situ (DCIS); the effects of different stressors on breast cancer; genetic abnormalities in breast cancer; breast cancer metastasis; and discovery of novel drug targets. Together, our physicians, researchers and advocates are pioneering efforts to develop novel strategies for diagnosing, treating, and preventing breast cancer, helping to establish more personalized treatments, and improving early detection methods. We need advocates to present our mission at national meetings to help build a nationwide network with other advocacy groups. We invite advocates to review and participate in developing breast cancer research projects, clinical trials, and grant review. This is an excellent opportunity for breast cancer patients to have an impact on the field of breast cancer research. (Meetings are held monthly). In general, planning and conducting research is overseen by various committees at the university level. Advocates are invited to join some of these committees and contribute to the oversight of basic and clinical breast cancer research. Advocates are invited to organize or participate in fundraising events for breast cancer research or outreach programs together with breast cancer researchers and physicians. Advocates are invited to educate others about healthy living, recommended screening, and survivorship issues, among other topics. For more information, check out the Magee-Womens Breast Cancer Program. 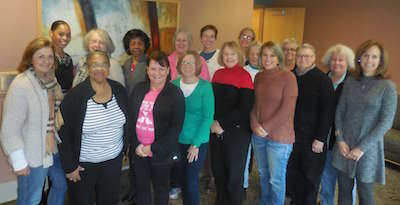 Magee’s Breast Cancer Peer Support Program is a group of compassionate, dedicated breast cancer survivors who are available to offer support to women newly diagnosed with breast cancer. Advocates are invited to support fundraising events for breast cancer research and outreach programs together with breast cancer researchers and physicians. In addition, financial contributions can be made in many different ways. For example, money can be donated in the memory or support of a breast cancer patient. For more information visit the Magee-Womens Research Institute & Foundation. We held our third BCRAN training session at the Magee-Womens Research Institute. 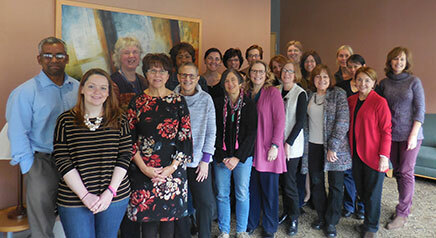 The goal of this retreat was to provide education on the role of clinical trials in breast cancer research. The agenda included an overview of BCRAN’s program (Karen DiVito), a presentation on “Radiology Clinical Trials/Breast Imaging Challenges” (Denise Chough, MD), an overview of the “Metastatic Program of Care and PCORI Grant” (Margaret Rosenzweig, PhD from the School of Nursing), a clinical trial testimonial from a patient participating in a clinical trial, a keynote presentation from Kathy Purcell, CEO, Susan G. Komen, Pittsburgh, a webinar on clinical trials in breast cancer by Elly J. Cohen, PhD, UCSF, a working session with patient navigators from Magee to enhance our collaboration and reach more patients to inform them about clinical trials, and an introduction to a new interactive web tool (https://www.wcrcanswers.com) allowing breast cancer patients instant answers to their questions about breast cancer and breast cancer clinical trials (Carola Neumann, MD and Carlton Ketchum, Medrespond). We had over 20 local and out of state participants! October 20, 2016 – BCRAN attends the Komen Pittsburgh event – Survive, Empower and Thrive. Carola Neumann, MD introduces BCRAN to participants. 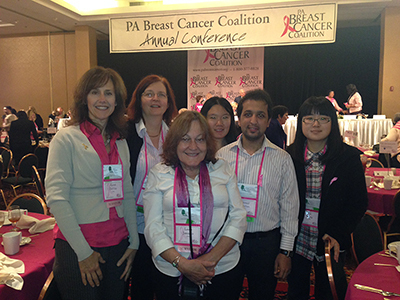 October 10, 2016 – BCRAN (Mary Samuels, Joanne Kreider) participate in the PA Breast Cancer Coalition Conference in Harrisburg. 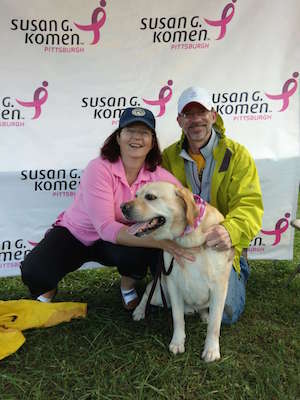 October 2, 2016 – WCRC researchers participate in Komen’s 8th Annual Paws for the Cure Dog Walk at Hartwood Acres in Allison Park. From left to right: Steffi Oesterreich, Adrian Lee (Sam in front). September 29-30, 2016 – BCRAN co-chaired and helped organize and participate in the first international invasive lobular breast cancer meeting at Hillman. To increase collaborations among the different groups studying ILC worldwide, 130 researchers, clinicians and advocates got together at the 1st International ILC Symposium that was held in Pittsburgh in September 2016. Members of our local BCRAN supported the organization of this meeting, spearheaded by Heather Hillier, an ILC survivor. A Q&A with the breast cancer advocates was held on the evening of the first day of the meeting (watch here). At the closing of the symposium, the advocates presented their conclusion and immediate goals. Abstracts and additional details of the agenda can be seen here. 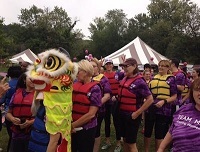 September 24, 2016 – BCRAN is represented at the Steel City Dragon Boat Festival. What an empowering experience! For more info on this annual event go to http://www.steelcitydragons.org. September 8-10, 2016 – BCRAN presented at the Great Lakes Breast Cancer Symposium at Hillman about the role of breast cancer research advocates and gave a program overview about BCRAN (Karen DiVito). June 29, 2016 – Regional Cancer Moonshot Initiative at Hillman. BCRAN participated in discussion to improve cancer care nationwide. For more info visit https://www.cancer.gov/research/key-initiatives/moonshot-cancer-initiative. June 12, 2016 – Magee Breast Cancer Survivor Day. BCRAN informed survivors about BCRAN’s work. 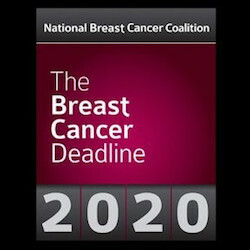 April 30 – May 3, 2016 – The National Breast Cancer Advocate Leadership Summit, Washington, D.C. The Summit was an opportunity to meet with leaders in the fields of medicine, politics, innovation and more. Interactive sessions offered the chance to share ideas and network with other advocates from across the nation. Advocates Karen DiVito and Jackie Simon attended. April 13-15, 2016 – Komen Advocacy Summit in Washington, D.C. The Advocacy Summit was held April 13-15, 2016 in Washington, D.C. 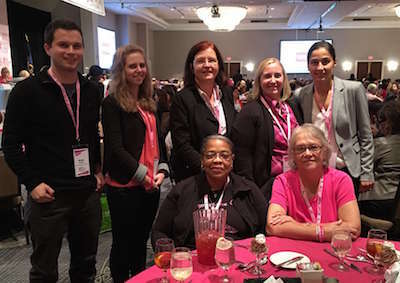 The Summit was an opportunity to educate and train volunteers from across the country on issues of critical importance to the breast cancer community. Representatives from the Affiliates, Advocates in Science (AIS), Komen Scholars and Komen staff came together as one voice to ensure that the fight against breast cancer is a priority among policymakers in D.C. BCRAN members Ruth Modzelewski, Jackie Simon and Daniel Garcia attended. April 12, 2016 – BCRAN participates in the LiveWell Survivorship Workshop. Healthy Living held at the Edgewood Country Club in Churchhill. 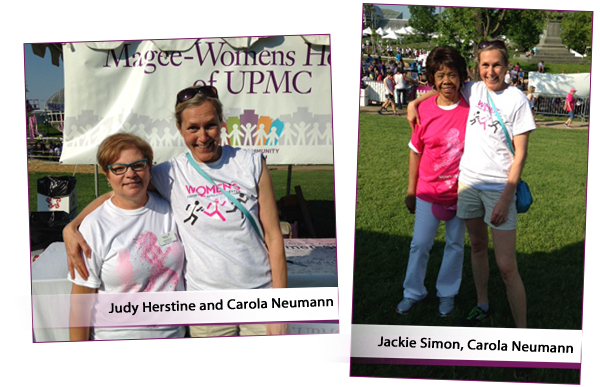 This event was very well attended and sponsored by Magee-Womens Hospital of UPMC and Magee-Womens Research Institute & Foundation. March 3, 2016 – Magee-Womens Education Series – BCRAN member Priscilla McAuliffe, MD, PhD spoke about BCRAN and breast cancer clinical trials. We held our second BCRAN training session at the Magee-Womens Research Institute. Our agenda included training sessions on breast anatomy and surgical treatment (Dr. Priscilla McAuliffe), breast imaging (Dr. Wendie Berg), survivorship (Dr. Josie van Londen), and clinical trials (Brenda Lee Steele). Our keynote speaker was Carol Matyka, who is a passionate advocate working for the National Breast Cancer Coalition (NBCC). Principle investigators also informed us about ongoing breast cancer research at Hillman (Mei Zhang, PhD; Yi Huang, MD, PhD; Susan Wesmiller, PhD, RN; Partha Roy, PhD; and Carola Neumann, MD). October 4, 2015 – BCRAN participated in PAWS for the Cure and informed survivors about BCRAN. 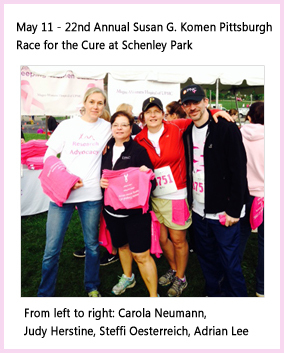 May 10, 2015 – BCRAN participated in the Komen Race for the Cure on Mother’s Day. November 8, 2014 – BCRAN “Boot Camp” session. 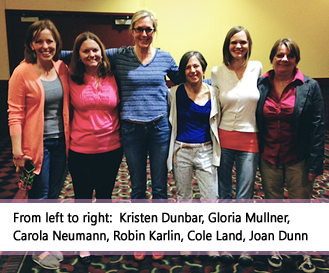 This boot camp was our first official breast cancer research advocate training session. The event held three informative sessions: “Basics of Breast Cancer,” “Breast Cancer Advocacy,” and “Moving Forward.” Breast cancer experts from UPMC Hillman Cancer Center and Magee-Womens Research Institute were present and gave outstanding educational lectures. The day was a huge success and very well received by the advocates, who in unison indicated that they had learned a lot about breast cancer through this event. 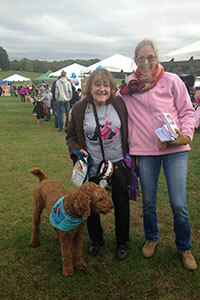 Visit the PA Breast Cancer Coalition website for event recap and for more information. Breast cancer advocates met in New York City for a Breast Cancer Research Foundation luncheon, to listen to a symposium panel discussion about the current unmet needs in clinical and basic breast cancer research, and to congratulate Breast Cancer Research Foundation grantees, including Hillman investigators Drs. Adrian Lee, Steffi Oesterreich and Thomas Kensler. Class description: Women’s cancer remains a devastating disease in the U.S. despite tremendous advances in detection and treatment and a significant decline in mortality, especially from breast cancer. To address this research need, the Women’s Cancer Research Center (WCRC) was developed in 2010 as collaboration between the UPMC Hillman Cancer Center and Magee-Womens Research Institute, with a mission to reduce the incidence and death from women’s cancer. This mission is achieved through the development and fostering of vibrant basic, translational, and clinical research aimed at translating novel discoveries into improved patient care. A major focus is the recent movement towards personalized or precision medicine, the ability to deliver the right therapy to the right patient at the right time with the goal that personalized medicine will improve patient outcomes while reducing unneeded toxicity. The WCRC aims to provide education and outstanding care to women in Pittsburgh and the surrounding region of Western Pennsylvania. Attendees will learn about recent advances in women’s cancer research and will have the opportunity to tour laboratories and see the work being performed towards saving women’s lives. Dr Adrian Lee (Co-director of the WCRC) gave an overview and goals of the women’s cancer research center and update on women’s cancer world wide. Dr. Bob Edwards (Co-director of the WCRC) provided a clinical gynecologic oncology update. Dr. Steffi Oesterreich focused on hormones and hormone resistance in breast cancer. Dr. Priscilla McAuliffe updated on DCIS and LCIS focusing on premalignant disease from a surgical point of view. Dr. Carola Neumann pointed out the importance of studies on the tumor microenvironment in breast cancer and the efforts undertaken at Hillman/WCRC to form a breast cancer research advocate group here in Pittsburgh. Dr. Shannon Puhalla focused on the role of clinical trials in women’s cancer research. Dr. Xin Huang spoke about the importance of ovarian cancer research at WCRC. We ended the class with a tour through of the WCRC laboratories. With 40 participants, the class was a huge success. If you would like to learn more about OSHER or want to sign up for next year, please visit Osher Lifelong Learning Institute. May 3, 2014 – “Decoding Annie Parker” viewing at South Side Works Cinema, organized by Robin Karlin and Cole Land (Pittsburgh FORCE outreach coordinators and BCRAN members). Educated patient advocates provide a unique perspective which cannot be duplicated by others. They are the ones who ultimately receive health care services and along with their families, are required to engage and navigate the complexities of the health insurance system. They have no agenda in the scientific community other than looking for the best science; they have no conflict of interest. Their perspective cannot be duplicated by the doctors who care for them or the scientists who search for answers, even if these doctors and scientists too are patients. A lay advocate perspective is key to moving forward to help end breast cancer. Although clinical trial research is essentially required for the development of improved cancer treatment strategies, only 13% of breast cancer patients nationwide (10% at Hillman) participate in these studies. Furthermore, for some patients, clinical trials can be a life-saving opportunity and for others, can provide access to improved medical and continuum of care. Allegheny County is not only an area with a high population density, but its age-adjusted breast cancer incidence rate of 133.8/100,000 is higher than that of the US and the state of Pennsylvania. Therefore, an obvious need to reduce barriers inhibiting clinical trial (CT) participation exists. Many studies have examined the reason for such low participation and found that barriers differ between patients and physicians. For example, a common problem for patients is the lack of knowledge about CTs in general or breast cancer health-related issues in particular. This reflects a need for public education that is also reflected by fear that CTs use patients as “guinea pigs” or that as part of a CT, standard treatment is withheld from a patient group. Some patients are denying CTs because they see it as their “last” treatment option. Taken together, it is not surprising then that these beliefs prevent patients from CT participation as demonstrated by the low enrollment mentioned above. Another contributing factor to low CT participation is the fear of additional costs for the patient. In most cases, costs for treatment and additional medical care are covered by the CT sponsor. In fact, CT participants receive better standard-of-care during the time of the CT, which for some patients can represent a “cornerstone” of their care. In fact, a CT can provide the needed medical care that a patient would otherwise have to pay for out-of-pocket. Clearly, several misconceptions accountable for low CT participation exist. Therefore, in order to make better progress on breast cancer treatments with the ultimate goal of curing patients, CT participation among breast cancer patients must increase. Therefore, educational outreach to both the public in general, and the breast cancer community in particular, is of great importance and a main objective of this proposal. Our second objective to address the need of increased CT participation is to utilize members of BCRAN to offer peer-to-peer conversations with patients. This intervention supports newly diagnosed patients that are often overwhelmed once they receive the diagnosis by a physician. Under these circumstances, additional information such as CT details are often not heard by the patients. Therefore, the opportunity of joining a beneficial trial can be lost. Our plan is to offer the patients a peer-to-peer experience in learning about CTs. For this we are planning to specifically recruit former CT participants to BCRAN who can educate the current members of BCRAN about the realities of participating in CTs. Secondly, CT-experienced survivors will be a valuable resource for patients who are considering participating in a CT.
Summer 2016 – BCRAN advocate Robin Karlin receives a scholarship from the Research Advocacy Network to participate in the American Society of Clinical Oncology 2016 Annual Meeting. The Focus on Research Scholar program offers new and seasoned advocates the opportunity to improve their skills and understanding of the research system and scientific concepts. Each selected Scholar participates in preparatory conference calls, virtual classroom (webinars), learning materials and mentoring for research advocates to improve skills and understanding of biomedical research. This preparation culminates with attendance at the American Society of Clinical Oncology Annual Meeting. Scholars then report back to their patient constituencies. Grant summary: In an effort to further refine and enhance the effectiveness of translational research to standard care in our community, it is the objective of this grant to train and educate Research Advocates in Allegheny to ultimately increase the participation of breast cancer survivors and patients in breast cancer research and clinical trials. Our key activities focus on expanding the current Hillman/WCRC BCRAN (Breast Cancer Research Advocate Network) program by opening up the program at Hillman/Magee BC program sites, including North Hills (Passavant) and South Hills (Bethel Park). 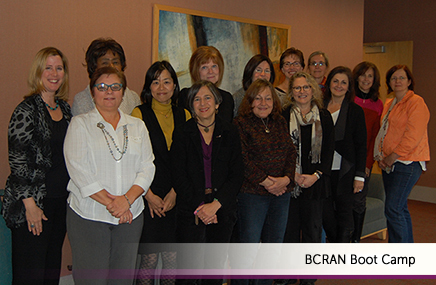 New BCRAN are trained to provide critical input and feedback on BC research. To increase patient accrual for clinical trials, we will educate newly diagnosed BC patients at BCRAN sites about available clinical trials. The program goals are measured by tracking attendance at the monthly meetings, as well as meeting participation, as documented on meeting minutes. Attendance at external training and any scholarships awarded, are tracked. BCRAN expansion (newly recruited advocates) are counted and asked to complete “pre” and “post” training surveys to measure the benefit of the information presented. Complementing BC research through Advocates’ input is measured by pairing Research Advocates with scientists & projects. Percentage of funded grants is tracked and increasing clinical trail accrual is measured against the baseline for 2013. Lastly, a Steering Committee will directly oversee the program direction. Researchers and clinicians in the Women’s Cancer Research Center study development and progression of ILC, a breast cancer subtype that has received limited attention in the past. ILC accounts for ~10%-15% of all breast cancers (~24-36,000 annually), and ranks as the 6th most common cancer in women. Over the last few years, increasing evidence has shown that ILC has unique molecular, clinical and etiological characteristics strongly suggesting that it needs to be considered as a separate subtype of breast cancer. To increase collaborations among the different groups studying ILC worldwide, 130 researchers, clinicians and advocates got together at the 1st International ILC Symposium that was held in Pittsburgh on September 29-30, 2016. Members of our local BCRAN supported the organization of this meeting, spearheaded by Heather Hillier, an ILC survivor. A Q&A with the breast cancer advocates was held on the evening of the first day of the meeting (watch here). At the closing of the symposium, the advocates presented their conclusion and immediate goals. Abstracts and additional details of the agenda can be found here. View a Q&A with Dr. Rachel Jankowitz that was published in TribLive. While breast cancer has generally been known as a female-specific disease, current research indicates that approximately 1% of all breast cancer diagnoses per year affect males. It should also be noted that current treatments for male breast cancer patients mirror the treatments of females with breast cancer. Even though the percentage of males with breast cancer is small, there is increasing interest in the study of male breast cancer to determine whether similarities and/or differences exist regarding its diagnosis and treatment. Therefore, BCRAN is interested in forming a Male Breast Cancer Study Group as an important component to building this partnership with scientists to accelerate the progress of male breast cancer research. BCRAN is offering a Male Breast Cancer Study Group. Enhance the relevance of research questions to breast cancer patients, survivors and co-survivors. Connect scientists to survivors/co-survivors who can speak for the concerns of the breast cancer population, including male breast cancer survivors, beyond their personal experiences, so that research goals and study feasibility can be developed together. Increase awareness about participation in research among new patients and those currently in treatment to improve clinical trial recruitment and enrollment. Include patients and survivors in developing critical science questions in order to increase funding for high-quality research. Questions about breast cancer or clinical trials? If you are interested in more information about the WCRC Breast Cancer Research Advocacy Network, please contact us at UPCIBCRAN@upmc.edu. If you are interested in providing financial or fundraising support please contact UPCIBCRAN@upmc.edu or visit the Magee-Womens Research Institute & Foundation.